The Amish Puzzle Ball is very colorful. It is perfect for little hands to grab as normal round balls can be difficult for babies to keep a hold of. 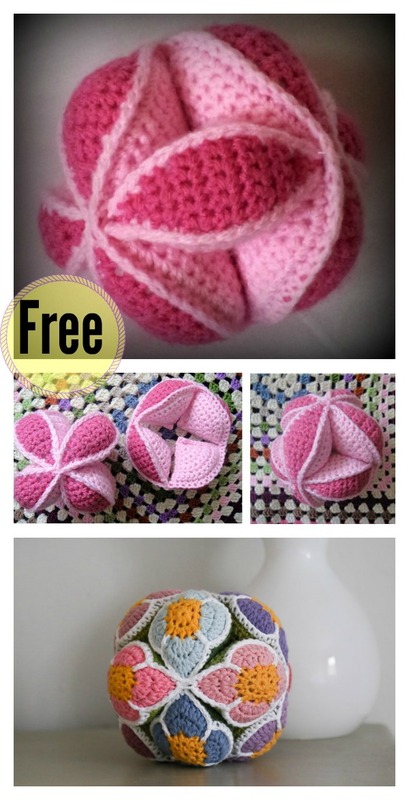 Amish Puzzle Ball Free Crochet Pattern may look super complicated to work up, but it is easier than it looks. It is a great one-evening crochet project and makes great gifts and is also a great stash buster. The kids are sure to love them. It is made up of 3 pieces that fit together like a puzzle. The end product of a puzzle ball looks really nifty and intriguing. Trying to assemble the puzzle ball is indeed great fun for kids and adults alike. Ready to try? You may also like Knit Ballband Dishcloth FREE Pattern.